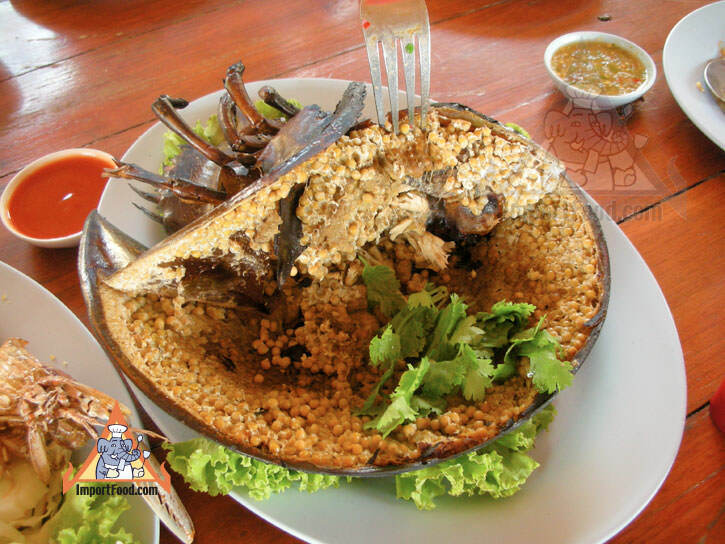 Maengda is a flying insect that some Thais enjoy eating when seasoned with Golden Mountain Sauce, or mixed into Maengda chile paste, but Maengda Talay is something entirely different. 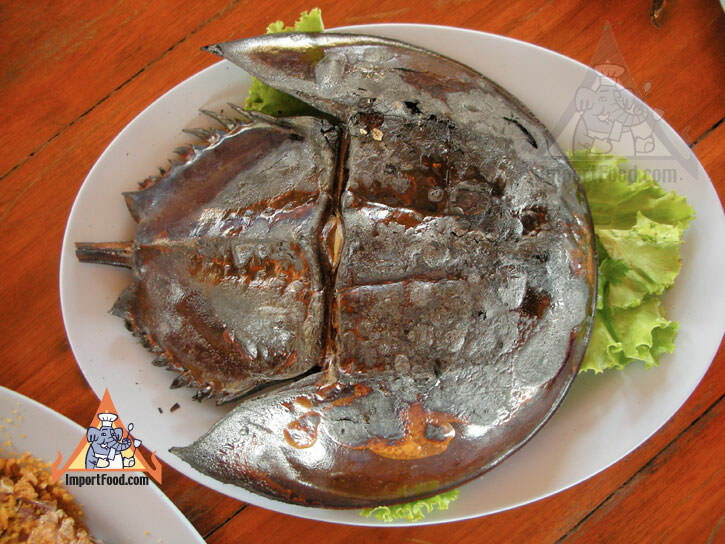 Talay means "ocean" in Thai, and Maengda Talay is what Thais call the horseshoe crab. From the pictures you can see it does look like a giant underwater insect. 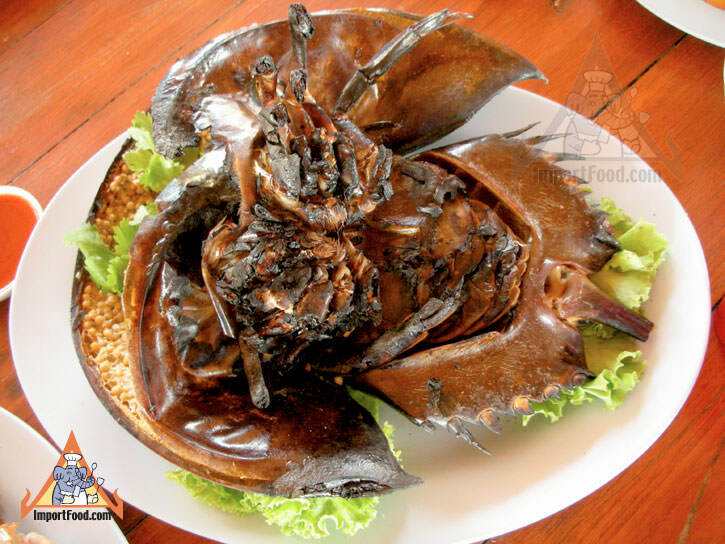 It's not easy to find horseshoe crab in Thailand, it's relatively expensive and only offered in some seaside areas. We had the chance to enjoy this freshly-caught maengda talay at one of the famous open-air seafood restaurants north of Bang Saen (where you'll find the best barbeque chicken). It's barbequed a special way then served with seafood sauce (pound in a mortar & pestle some lime juice, chopped garlic, fresh Thai chile and sugar). 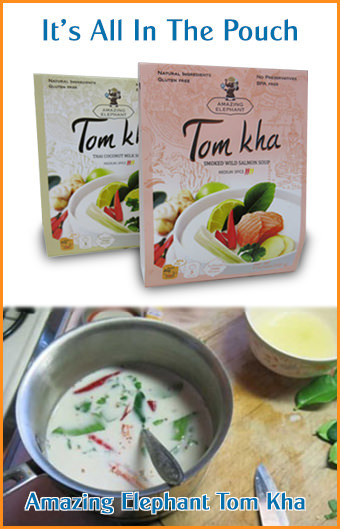 You just peel back the shell and it's loaded with small eggs, tasting a bit like shrimp. Include Sriracha sauce on the side too. It's delicious! Also see our report on barbeque chicken served at Bangsaen beach, and our street vendor video of barbeque chicken at Bangsaen.